Eighth place seems to be mine so far this year on the road. After finishing there in B race at Snowball No. 1, that’s where I landed Saturday at the VBW Smackdown. I’m surprised I finished that well. The little ones made sleep short and interrupted Friday night, so I wasn’t a fount of energy. Plus I got up early to take Ellie to her final swim meet, which ran long so I didn’t get to the race venue at Sleepy Hole Park until 30 minutes before my race. After I changed and registered, I barely had 1o minutes to warm up. But enough with the excuses, I honestly just didn’t feel like my legs were there. The course was a very narrow running track that might safely accommodate four riders abreast at a parade pace. But we were 34 or so running at an average 25mph. The tight first corner was downright frightening. I’m sure I hit my brakes more in this crit than in any other I’ve ever ridden. The narrow course made it difficult to move around in the group, so I spent much of the race deep in the pack. I did bridge to a two-man breakaway early in the race, but right after I made the juncture the officials rang the bell for a prime. I decided to go for that rather than trying to make the breakaway stick. Naturally, a rider from Richmond pipped me at the line for the $10 as shown in the photo above from Kevin. I moved up on the inside in the last few laps, but didn’t want to get too close to the front. My mistake. I slotted in about 10th wheel, but we rolled the last lap at nearly 30mph and I wasn’t able to move up further. Coming out of the final curve I was only able to pass two riders and the leaders clearly pulled away from me. Nice win by one-time Monday night running mate Dave Erickson from JRVS. It was cool to watch the 3 race and the 1,2 race after. 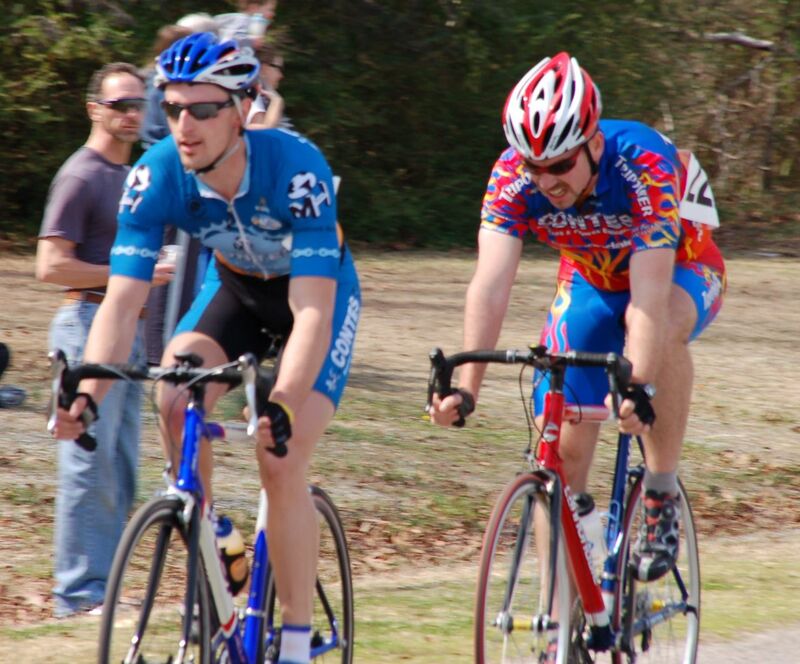 Bender was superstrong throughout the 3 race, driving a nine-man break that lapped the field. But he got pipped by VBW’s Nisbet in the sprint. Greco bridged to a powerful break early in the 1,2 race and held on for a while. Still don’t know how that race turned out, but he dropped off their torrid pace right before I left.